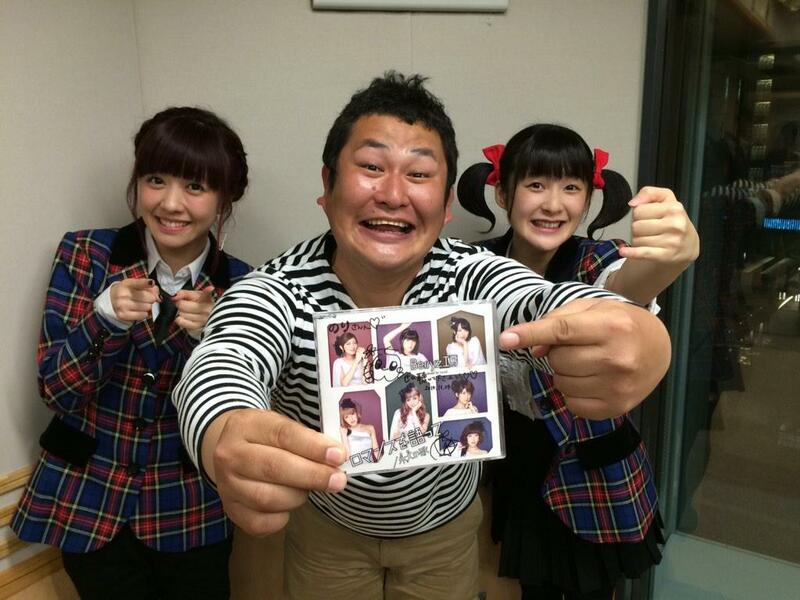 Snippets from a radio show Captain and Momochi were on, doing promotions for their final single 'Towa no Uta / Romance wo Katatte'. For reference, this was way before Captain announced that she'd become a H!P Advisor, though after it was revealed that Momochi had been named as Country Girls' Playing Manager. The host has an extremely enthusiastic welcome for Saki-chan... and a terse, much-less-excited welcome for Momochi. Momochi immediately points out the difference in treatment, but the host brushes it off. As you'll see, this'll be a recurring theme. All in good fun though. Shimizu: It's not as if it isn't sad to part, but beyond that sadness, we'd like to enjoy the moment. Tsugunaga: Yup, it's really sad. Shimizu: I don't have anything decided yet. Host: You haven't thought of anything? Shimizu: Not yet, though it is something that's playing on my mind. Host: So Momochi, what have you been thinking about? Shimizu: (laughing) She's running away from the question! Tsugunaga: For me, the greatest luxury is getting to sleep without my alarm clock on, and waking up at noon. Shimizu: I go shopping, I love it. But I'm generally indecisive, so if I go with friends, I'll end up taking lots of their time. So I generally go alone. Host: What's your eternal thing, the most important thing to you, something you can't give up? Tsugunaga: (cutting in) It's the same for me~! Shimizu: She said something different before. Tsugunaga: No, that's what I think from the bottom of my heart. Host: Well of course Berryz Kobo is important to you, but besides that, is there anything that's important to you? Tsugunaga: Well, as mentioned before, it'd be my cuteness. It's not that I want it to continue forever, but it continues to remain eternal of its own accord. Host: Scary, isn't it? It's neverending? Host: Do you have siblings? Shimizu: I've got an older brother. Host: Are you on good terms with one another? Tsugunaga: I'd say that our relationship nothing out of the ordinary. Host: Momochi, the way you say it lack persuasiveness. Are you just on good terms for business purposes? Tsugunaga: We don't have that sort of reciprocity. Host: Well said! (laughs) And Saki-chan, you have an older brother? Shimizu: Three years my senior. Host: Your brother must have been completely fine with such a cute little sister. Shimizu: No way. In the past, it was like we used to quarrel every day. It's only recently that we started being able to talk with one another. Host: I still quarrel with my brother even now. Shimizu: Is that so? That must be tough. Host: This discussion has gotten a bit too realistic (laughs). Host: So what sort of pyjamas do you wear when you go to bed? Tsugunaga: You know, you've got this huge grin on your face as you're asking us that! Ewww! Host: Saki-chan, what do you wear as pyjamas? Tsugunaga: Yes Saki-chan, what do you wear? A negligee? A negligee? Shimizu: Shorts and a T-shirt. Comfy clothes. Host: What colour are your shorts? Host: Ooh, the same as me. Tsugunaga: So where'd you get them? Uniqlo? Uniqlo? Tsugunaga: Saki-chan, you've seen them before, right? Host: Is there really that much lint? Host: Is there something you always need to have at meals? Shimizu: It used to be milk, but recently it's been water. Tsugunaga: I don't order drinks. And it's not because I'm poor! Even at concerts, I don't drink much, so I don't sweat that much. Host: That might not be a good thing - your sweat shows how much you're into the performance. Shimizu: Ice cream. Any flavour. Refreshing ones or sweet ones. I could eat ice cream 365 days in a year. Tsugunaga: Yeah, she had some, about half an hour before the broadcast. Host: Isn't it cold right now? Shimizu: The season doesn't matter (laughs). I can have ice cream the whole year round. It's a daily reward to myself. Host: Ice cream, that's nice. And Momochi? Host: Idols don't really eat yakiniku, do they? Shimizu: We do, we do. Berryz Kobo loves yakiniku. Host: You're quite the carnivores? Host: Like, you don't eat rice? Shimizu & Tsugunaga: We do, we do. Tsugunaga: A large helping, in fact. Shimizu: I do. I love white rice. Host: I see. I quite like white rice myself. Tsugunaga: You would, wouldn't you (laughs). Host: Isn't it unfair? She eats ice cream and rice, but it doesn't show on Saki-chan at all. Tsugunaga: She's got a slender skeletal structure. Tsugunaga: Why would you even need to look that up! Host: Momochi, your lint character is amazing! Host: You might as well just go on to be 'Lint' Momochi. What do you think about being a lint character? Tsugunaga: It doesn't make me happy at all. Tsugunaga: That's true, there are people who look at my clothes instead of my eyes (laughs).